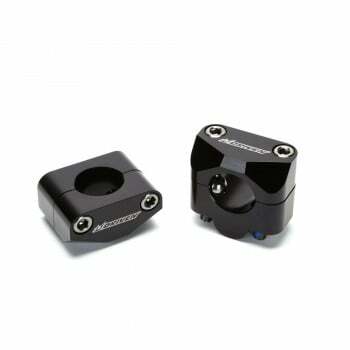 Renthal Zero Offset Handlebar Clamp Mount 1-1/8"
Renthal Zero-Offset Handlebar mount/clamp for 1-1/8" handlebars. Fit fit Honda and Kawasaki! 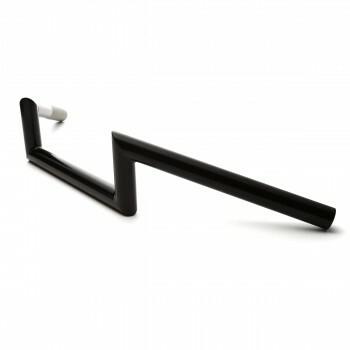 A must have item to change from 7/8" handlebars to 1-1/8"! Renthal Zero-Offset 1-1/8" (28.6mm) handlebar clamps/mounts are perfect to upsize your handlebars from 7/8" to 1-1/8"! Direct replacement for Honda and Kawasaki! 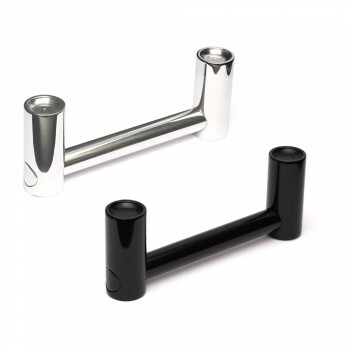 Easy to install, simply remove the stock handlebar mounts and put these in place! Steady Garage R&D: The included bar mount studs overall length is 77mm, once inserted into the bar mount, the stud will protrude 47mm with a 34mm stud-shank (non-treaded area). Depending on the thickness of the applications top triple clamp, if it's under 35mm thickness, some 12mm (~1/2") washers may be needed. Optional shorter 68mm studs could be purchased separately as a option (please select check box). For Honda Grom 125, the shorter studs or washers will be required. This only applies to the Zero-Offset Renthal Bar Mounts. Renthal’s 1 1/8” (28.6mm) handlebar mounts are designed to allow the mounting of oversized 1 1/8” handlebars, such as the Twinwall or Fatbar, on certain model motorcycles which are equipped with 7/8” handlebars as standard. These are CNC machined from 6086 T-6 billet aluminium and black anodized with laser etched Renthal logo. Designed to use the OEM rubber cones, replacement studs are available. Sold as a pair. 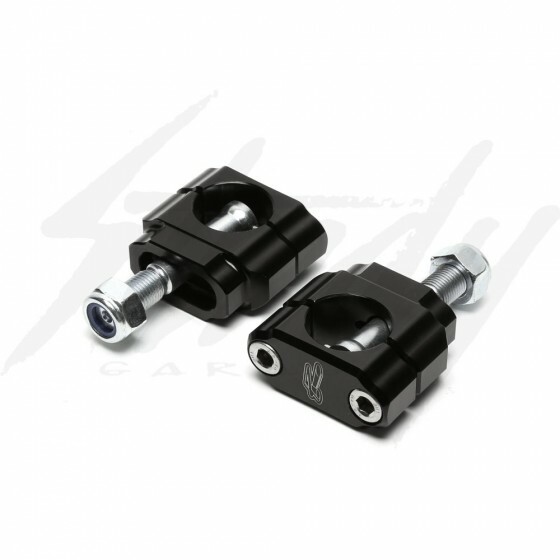 The clamps are CNC precision machined from 6082 T6 solid billet, high strength aluminium alloy. 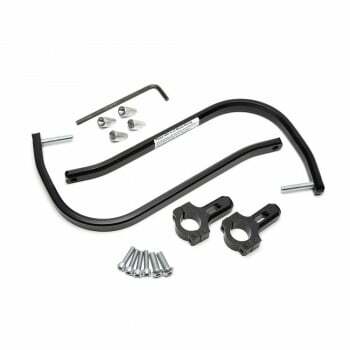 Precision CNC machining ensures a perfect fit between the handlebar and clamp for maximum clamping strength. The bolts are CNC machined from nickel chromium molybdenum 817M40 steel and the hardened and tempered to grade W strength. A unique bolt head design with part hemispherical seating blended into the shank minimises the chance of bolt failure. Renthal bar mounts are designed to replicate the bar postion of the OE bar mounts. Please note Renthal bar mounts are designed to utilize the OE rubber cones. Moose Racing Aluminum Handguards 7/8"
Moose Racing Aluminum Handguards 1 1/8"